Hello everyone, welcome. Today I am going to be writing another review for the most recent addition to my World of Darkness Library. 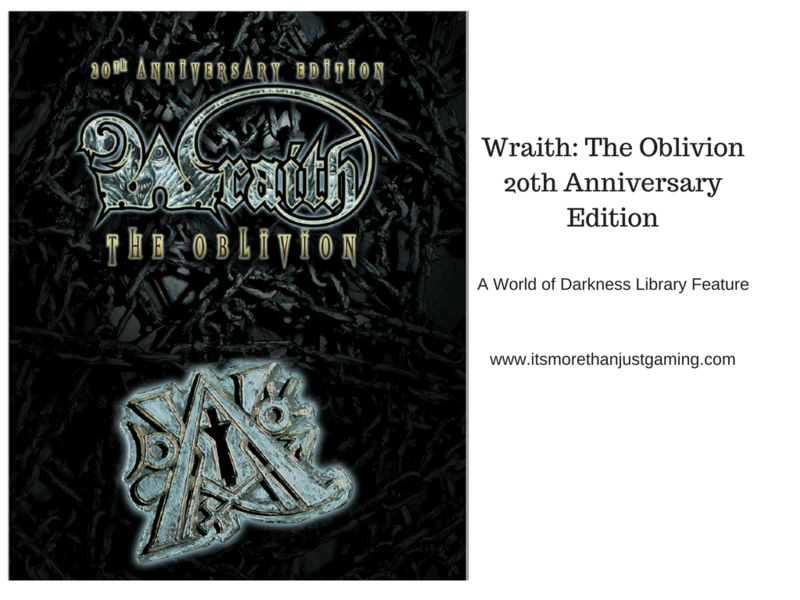 In this case, it is the 20th Anniversary Edition of Wraith: The Oblivion. Disclaimer, this post contains affiliate links. I am a major fan of the World of Darkness series of games, and have been for near enough quarter of a century. I have enjoyed playing in the bloodthirsty world of Vampire Politics (yes, that pun was intended), have enjoyed running with a pack of Werewolves (if only for a few sessions) and even dipped my toe in running a Hunter game for some of my friends. I’ve read about Changelings and I have been mystified by Mages. But one system I never engaged with was Wraith: The Oblivion. I always figured, what is the point? I have played Vampire for years and whilst there is semi frequent crossover with Mages, Changelings and, more frequently, Werewolves, there was hardly any crossover with Wraiths. Unless you were playing a Giovanni or specialist Tremere. I always tended to view the different lines through the lens of my favoured game, Vampire. So, for a quarter century of gaming, Ghosts were relegated to nonentities in my games. After all, there are plenty of things to concern yourself with in the world of the living. But I have to admit, delving into some of the other world cosmology that you get in Werewolf and Changeling (and Technically Mage) I was always a bit curious and fascinated by Wraith. I had the opportunity to play a One Shot of Wraith earlier this year, which you can read about HERE. If you can’t spare the time to read it, just imagine me playing a character that is the result of Yoda from Star Wars and Madame Gao from Netflix Daredevil having a baby. In the run up to the release of Wraith: The Oblivion 20th Anniversary Edition, a supplement was released, the Wraith 20: Handbook of the Recently Deceased, which I grabbed a copy of and reviewed HERE. It was a great little book but I suffered a bit for never having read the rules of Wraith before. And now I have. In every World of Darkness game, you play either one form of supernatural or something that hunts them. In Wraith: The Oblivion it should come as no surprise that players take the roles of ghosts. Though, specifically, Ghosts with unfinished business. In general terms, players start play in the Shadowlands, a world that sits beside our own and mirrors much of it albeit in a bleak and decayed fashion. Players begin the game in a cocoon, their Caul. Play might start with them breaking out of their Caul or being freed by other Wraiths, or it might even start a few days in with players having no recollection of how they died or how they got to where they are currently. They will find that as with all World of Darkness games, they have an arsenal of supernatural powers called Arcanoi, however equally, as with all WOD darkness games, these Arcanoi have a cost. They will find that their characters have ties to the skinlands, in the form of fetters. Fetters are things that are precious to the wraith, things they have strong feelings for. So it could be a place with fond memories attached, a treasured possession or even a person. These fetters are places that Wraiths can rest and heal and that give them a sense of strength. However, wraiths also feel the pull of Oblivion. Oblivion sits at the very edge/very bottom/middle of the Underworld. Cartography in the Underworld and the other realms of World of Darkness is an exercise in madness. Perhaps think of reality as an onion. The Skinlands, the land of the Living is the top layer, then there is the Shadow Lands, and then there is the Tempest and the Sunless Sea, which leads to the Kingdoms of the Dead, and beneath that is the Labyrinth and then Oblivion. My advice here, try not to get your head round it all at once, it’ll give you a nosebleed. Anyway, Oblivion is an everpresent threat constantly tugging the Wraith down, the only thing preventing the wraith’s spiral is attachment to fetters and pursuit of its Passions. Passion is the fuel of a wraith in the same way Blood fuels a vampire, Quintessence fuels a mage and Rage or Gnosis powers a Werewolf. Wraiths are creatures of strong passion. They must be, else they would not have manifested as a wraith. However, every wraith also has a dark side, a Shadow that is fueled by Angst that wants to cause the wraith to fall to oblivion, dragging as many allies or enemies with it as possible. That is a very short introduction to the world of Wraith, and I have barely scratched the surface. Literally in this case, given the layers of the onion I mentioned. So, let’s get on to talking about the Book itself. There is a lot of Underworld Lore in this book and it felt well organised so that as I read, I wasn’t baffled or lost by overwhelming amounts of data. It felt like the book was laid out well, dealing with the geography (such as it is) and history of the underworld – including the first ferryman, Charon – ruler of Stygia (until he disappeared). There is also a really cool 2 page map of Stygia. That was awesome. The Lore deals with Wraiths in the Shadowlands, and Wraiths in underworld empires, such as Stygia. It presents basic information on all of the Stygian Legions (which you have to admit, sounds cool when you hear that) and how you become members of any given legion. I suppose it is more accurate to say what criterion causes a partiular legion to conscript you as wraiths seldom have a choice. (Of course it is better than being deemed worthless and taken to the forges and turned into a chair or something) It also talks about the various guilds, technically outlawed, and how they interact with wraith society. The Guilds being the main source of rare arcanoi, and often having specific feels and ways they are perceived. There are so many different options of game types to choose from, more than any other World of Darkness game. There are rules for playing/starting as a Wraith (ghost), a Spectre (A Wraith that has fallen to Oblivion), a Risen (A Wraith that has made a pact with its shadow and taken possession of its body and walks in the skinlands) or even as a Human Orpheus Agent (Humans who use drugs to project into the skinlands). Then you have the added complexity of factions, such as the Stygian Hierarchy or the Heretics, within the Underworld, which can take any one of the above and give it an entirely different feel and finally there are the different locations your game might be set in (there are many distinct empires in the Underworld, as well as the Shadowlands, Necropolis and even the city of the Boatmen.) You get a lot of different games from one rule set. Wraith has a unique system among the World of Darkness games in that the negative aspect of the character, the Shadow, gets its own stats (up to a point) and someone to play it. Whereas in the likes of Vampire when a character falls to frenzy, they become a ravening beast of instinct intent on murder, the shadow is an ever present duplicitous personality that is constantly trying to lure the Wraith character into bad decisions, or offering help that might tip the balance – but that comes with a hefty price attached. Wraith has a very good shadow creation guide, and detailed suggestions on how a player might best play this destructive force. There are other helpful suggestions on Shadowguiding in the Handbook of the Recently Deceased. I can’t really say there was anything in this book that I disliked. There is a lot to take in, and if this is your first venture into the Underworld (or not your first, but also not your first game of choice) everything you can do, and everything that can happen can be a bit overwhelming. I certainly have found running my Vampire games a bit smoother and fluid when I got my Beckett’s Jyhad Diary DM Screen, however I have no such thing for Wraith (and haven’t been able to find Wr20 one as yet, but hope there will be one available to all if only in PDF form). Having such a thing would be quite useful. This is a fantastic core rulebook for an incredibly detailed game that stands alone either as a strong game in its own right or as one that can easily be incorporated (with some imagination) into other World of Darkness games. Wraith: The Oblivion 20th Anniversary Edition is a available on Drive Thru RPG. Dwarven Smithy – A Game of Smithing, and Dwarves.